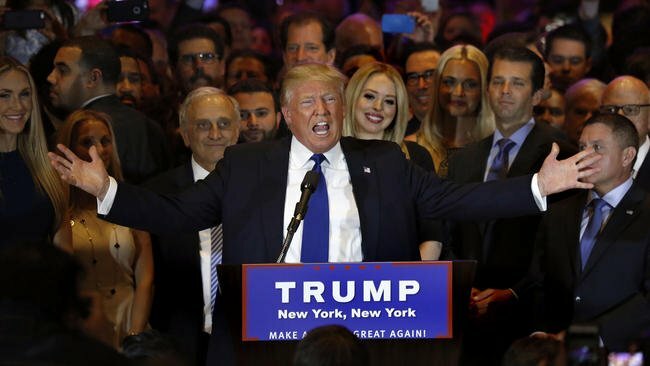 Republican presidential hopeful Donald Trump has won the New York primary while Hillary Clinton has triumphed in the Democratic race. With the majority of votes counted, Donald Trump looks set to extend his lead over rivals Ted Cruz and John Kasich. Meanwhile, Democratic presidential candidate Hillary Clinton, a former senator for New York, is on course for a victory over Brooklyn-born Bernie Sanders. Wins will put Donald Trump and Hillary Clinton closer to securing their nominations. With more than 98% of the results in, Donald Trump is leading with just over 60% of the vote while Hillary Clinton has just under 58%. The billionaire businessman said he was going to get more delegates than “anyone projected even in their wildest imaginations”. The big question is whether Donald Trump will make a clean sweep of all 95 Republican delegates at stake in New York by earning the majority of votes. This would reduce the chances of a contested nomination at the GOP convention in July. Claiming her win, Hillary Clinton told supporters her campaign for the nomination was “in the home stretch and victory is in sight”. “New Yorkers, you’ve always had my back and I’ve always tried to have yours,” she said. The Democratic campaign has turned increasingly negative, with Hillary Clinton and Bernie Sanders trading barbs about their qualifications. Following the latest result in the race for the Democratic nomination, Hillary Clinton said there was “much more that unites us than divides us”. The two front-runners for both parties cast their own votes in New York on April 19. Donald Trump cast his ballot at Central Synagogue in Manhattan in the morning, while Hillary Clinton voted with her husband, former President Bill Clinton, near their home in the suburb of Chappaqua. They are the last presidential candidates to vote in the primary contest. Bernie Sanders voted in his home state of Vermont in March, while Republican challengers Ted Cruz and John Kasich went to the polls in Texas and Ohio. The voting in New York was marred by widespread complaints of irregularities, including more than 125,000 people missing from New York City voter rolls. The city’s chief auditing officer, Scott Stringer, ordered a review of the city’s Board of Elections (BOE) over what he called “chaotic and inefficient” organization. Although Donald Trump was sweeping to victory across most of the state, Ohio Governor John Kasich, otherwise in a distant second place, was leading in his home borough of Manhattan.